Béarnaise and horseradish are the perfect match with beef. 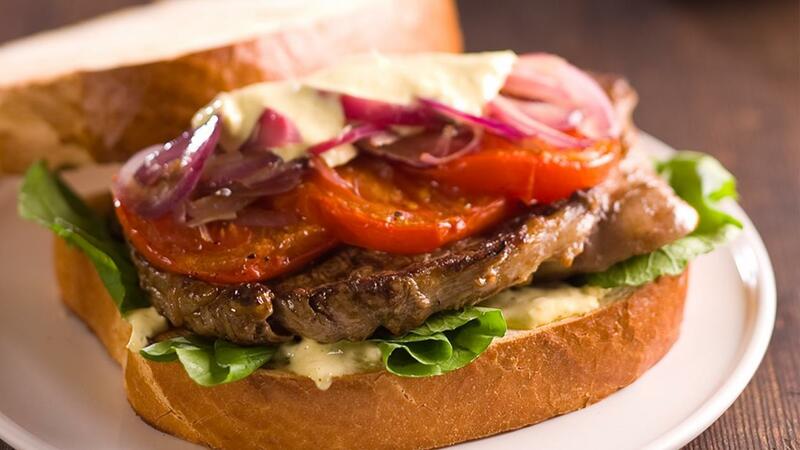 Combining them together adds a new dimension to this steak sandwich recipe. Preheat the olive oil in a large fry pan, cook the steaks to the desired liking, remove from the pan and keep hot. Lightly fry the sliced red onions until golden, remove and keep hot. Slice the tomato, drizzle with the vegetable oil and bake in a pre-heated oven (180 degree Celsius) for 5 minutes, remove and set aside for use. Combine the KNORR Garde D'Or Béarnaise sauce and Horseradish cream, heat and set aside for use. Assemble the steak sandwiches in the following order - toasted bread, horseradish sauce, rocket, tomato, steak, onion and toasted bread. Serve with the fresh crispy fried shoestring fries.